IWU is honored to be one of the few colleges or universities accepted to participate in the Community College of the Air Force (CCAF) General Education Mobile (GEM) program. As a signatory of the Department of Defense Memorandum of Understanding for Post-Secondary Educational Institutions (DoD MOU) IWU complies with all requirements of Executive Order 13607 and the Principles of Excellence for Educational Institutions Serving Service Members, Spouses and Other Family Members. The GEM partnership empowers CCAF students to complete their General Education requirements as a single block, from the same institution allowing for faster completion of their Associate Degree. Indiana Wesleyan offers a wide range of general education courses approved by the CCAF. Establish your education goal in your Air Force Virtual Education Center (AFVEC) account. Be sure to attend a Tuition Assistance (TA) briefing offered through your local education center. Review the GEM Course Offerings in the subject areas needed to complete your CCAF degree and select those courses of most interest to you. IWU offers a wide range of general education courses approved by the CCAF. Complete an online IWU Application. There is no application fee and the process takes just a few minutes. 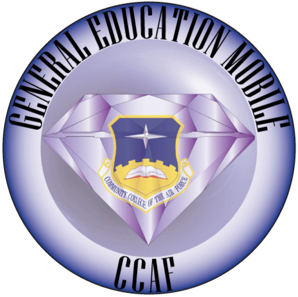 During the application process, select Air Force GEM from Academic Program list. Talk with an IWU Program Representative specifically qualified to assist you with the completion of your CCAF Degree. Apply for TA/State Scholarship Program using your AFVEC account. Once your TA has been approved, print a copy of the approval and keep it for your records. You DO NOT need to send a copy to IWU. As an Air Force GEM student at IWU you have an exciting opportunity available to you once you’ve completed your CCAF degree. If a master’s degree is something you’ve thought about, consider the new IWU Associate to MBA program. We encourage you to consider this option as you work on your GEM courses and completing your CCAF Degree.